Discussion in 'Weed Edibles' started by Fumar Verde, Apr 5, 2013. Hey guys! I've really been getting into Green Dragon lately, and wanted to share my recipe with you guys to possibly try it out. Its a bit detailed, but it has gotten me exceedingly gone every time. I actually have 3 batches I'm working on right now, and will update you guys as I go through the motions. 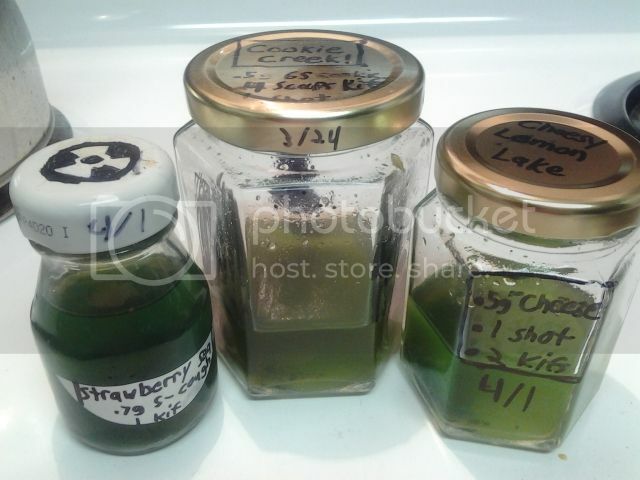 Pix of those batches are at the bottom. * = Mason jars, spaghetti or preservative glass jars work well too. You want a tight seal. *** = Fine mesh, coffee strainer, etc. I use those free Nylon pantyhose at all the shoe stores. **** = 1 FL is 2/3s of a shot. Also, use 190 Proof Everclear, 151 Proof Rum, or Lemon Extract (166 Proof). The stronger the better. Throw it in the center of a small sheet of aluminum foil and wrap tightly into a foil burrito. Once oven is finished, throw the foil burrito in and set a timer for 25-30 minutes; your choice. When its done, check the herb -- it should be darker, usually a bit browner/golder, and smell more pungent. Grind this up into slightly coarse powder. Add the ground herb into the glass jar. Make sure to get AS MUCH of the material as possible into the jar. Tightly seal the jar and viciouslyshake the mixture. Wait a total of 2 to 3 weeks after making the mixture to cook it. Clip your candy thermometer to the inside of the jar; ensuring the meter is submersed in the liquid. Pour water into the saucepan or pot until the water line matches up with fluid level in the jar. Heat on medium-low heat [On my electric stove; from 1-9, I do 4]. You are now HEATING ALCOHOL in a FLAMMABLE ENVIRONMENT, this is where you need to be attentive. Definitely turn on the overhead air fan if you have one. Once you reach 165-175, turn your heat down to low heat [1-2], maintain that temperature range, and set your timer for 25 minutes. * You can boil it for longer if you want it to be more concentrated; but keep an eye on the level of alcohol to plant matter. I usually don't rush into this part because the liquid will still be VERY HOT as will the glass. I have had glass temperature shock before where a batch was ruined because the glass shattered. I'd wait 5-10 mins. Set up your straining rig -- I like to fasten either a fine sieve or nylon pantyhose over a measuring cup with a rubber band. Pour the liquid through the strainer. Use a metal spoon or rubber spatula to squeeze as much liquid as possible into your cup. You can either discard the herb or save it -- I've begun to save it because I've found there is still trace amounts locked in the plant matter (add it to butter). The strained liquid is now ready to be consumed. There will likely still be a bit of kief in there [if you followed part 2A] so it will continue to get stronger over time. Pour the liquid into a small glass jar; you might want to use something with a small inner surface area so that you wont have residue all up the sides. Generally, I would stick it in the freezer [helps with consumption]. I've found that it is incredibly earthy and breathtakingly alcoholic; not the most pleasant to drink by itself. Good mix suggestions: Orange juice, Grapefruit Juice, 7 Up, Cranberry Juice. I find that I start feeling initial waves within 15-20 minutes; with a strong, persistent peak after about 45 mins. If you take this stuff and smoke a half hour later... your gonna have a good time. Man I've been reading about tinctures lately and I really want to try making one, either this or like a glycerin tincture. If you boil some of the alcohol down so it's not so damn alcoholic, would it be good to just throw into a 20oz mtn dew or something for incognito? I know it would be beastier, so testing required but sounds like a good plan to me lol. Definitely would work. I highly suggest giving it a try, you can even personalize it a bit i.e. add more herb to make it stronger, boil it longer, etc. to experiment with your own results. Yeah both are really awesome. 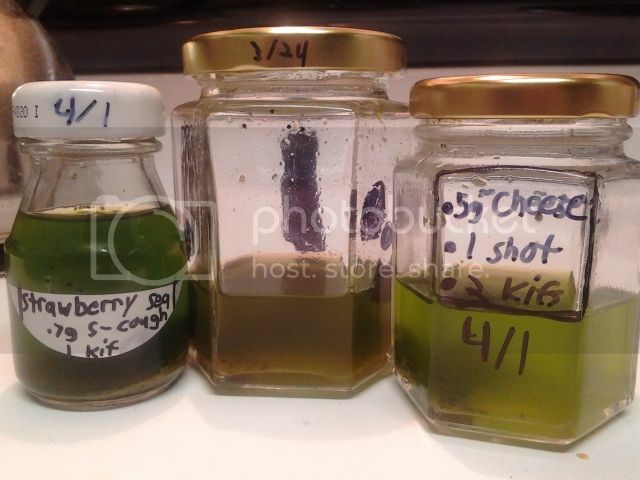 I make my glycerin tinctures a little bit differently, but for the alcoholic one you should definitely try it out. Its perfect for taking right before concerts, long trips, nature walks, etc. You just feel like your body is separated from your head and your submerged underwater at the same time lol.